Turbo compressors are used for injection or compression of gases. Turbo compressors are consists of three major parts; compressor wheel, diffuser and housing. It has a wide range of application in chemical and oil and gas industries. Turbo compressors are essentially used for transmission and processing of all kind of natural gases. Apart from the industrial application, turbo compressors are used to supercharge the piston engines. Global turbo compressor market stood at a valuation of USD 12.2 Billion in 2016 and is anticipated to grow at robust compound annual growth rate (CAGR) of 6.2% over the forecast period. In the terms of region, global turbo compressor market is segmented into five major regions: North America, Europe, Asia Pacific, Latin America and Middle East & Africa region. 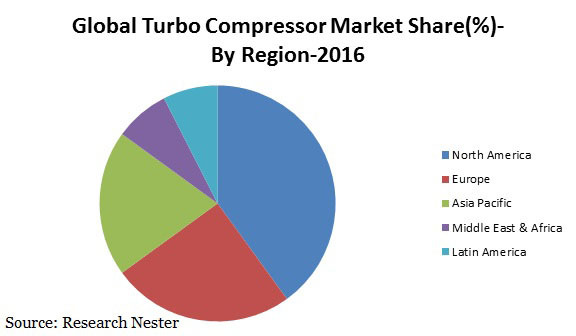 North America is estimated to account for more than 40% share in the overall turbo compressor market. Further, North America region is expected to witness steady growth owing to maturity of the market of turbo compressors in this reason. Additionally, increasing liquid and natural gas trade in this region is expected to propel the demand for turbo compressor in near future. Moreover, population growth and industrialization in emerging economies such as India & China are some of the key factors which have led Asia Pacific region to become most favorable and revenue generating market for the turbo compressor. Further, Asia Pacific region is expected to dominate the global market of turbo compressor over the forecast period owing to the factors such as presence of large chemical factories and oil refineries in Asia Pacific region. Increasing liquid natural gas (LNG) trade is one of the major factors which have impelled the demand for turbo compressor in almost all regions. Since, turbo compressor has a wide range of application, the growth of sector such as oil & gas refinery sector is anticipated to propel the demand for turbo compressor in near future. Furthermore, increasing demand for turbo compressor due to emergence of new oil and gas refineries in Middle East & Africa region is expected to propel the growth of global turbo compressor market in near future. Apart from this, the demand for turbo compressor is expected to increase in power generation sector. Further, the use of turbo compressor in power generation sector is anticipated to foster the growth of global turbo compressor market over the forecast period. Additionally, high popularity of axial turbo compressor is a major factor which is driving the growth of global turbo compressor market. However, availability of alternative technologies in compressor sector such as rotary screw compressor is expected to hamper the growth of turbo compressor market in near future.